Heel Pain - Plantar Fasciitis is a painful inflammatory condition caused by excessive wear to the plantar fascia of the foot, or from biomechanical abnormalities that cause over pronation of the foot. The plantar fascia is a thick fibrous band of connective tissue originating on the bottom surface of the calcaneus (heel bone) and extending along the sole of the foot towards the five toes. 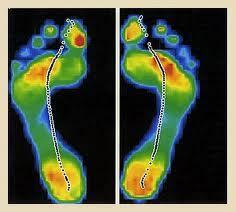 The pain is usually felt on the underside of the heel, and is often most intense with the first steps of the day. It is commonly associated with long periods of weight bearing or sudden changes in weight bearing or activity. Obesity, weight gain, jobs that require a lot of walking on hard surfaces, shoes with little or no arch support, and inactivity are also associated with the condition. This condition often results in a heel spur on the calcaneus, in which case it is the underlying condition, and not the spur itself which produces the pain. Achilles tendinitis can sometimes be associated with plantar fasciitis. Treat the source and the symptoms will subside! What is the most effective treatment for heel pain? What exercises & stretches do you recommend for heel pain? What other symptoms are most commonly associated with heel pain? What shoes are best for heel pain? Where can I get medical hardware for heel pain?